How Do You Organize Your Burda Stash? It feels like forever since I have been able to sew anything… And I am afraid to say I haven’t quite started back yet. I got some necessary mending done… but not much else. I am still organizing the sewing space. Mostly because it sort of became an all-purpose storage space when I moved home from school. Since I can now actually walk into my bedroom and get into bed without having to move mounds of stuff, the sewing space is my next area to tackle, so I should be back in action by next week. With any luck. I hope. Anyway, in light of the fact that I have been organizing like crazy, I thought I would do a post about pattern organization. Especially since a few posts ago Sewing Sveta asked how I organize my Burda stash. 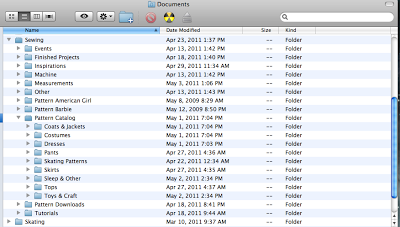 I have to admit, it takes a fair bit of effort to keep things organized. Personally, when I want to start a new project I tend to think about the garment type first (dress, pants, jacket, etc.) then look for a pattern similar to what I had in mind. A long time ago I did a post about my digital pattern catalog. 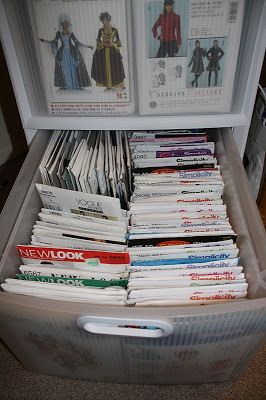 I still use this method of organizing/cataloging/searching through my pattern stash. Basically, I take a screen shot or scan of the pattern and then store the digital picture file under the pattern name and number within a category. Since I started doing this when I started collecting Burda magazines, it only takes me about an hour to catalog new patterns each month when the new issue goes up on the Russian archive site. It takes me a bit longer if I get a Patrones or Knipmode, because then I have to scan the actual magazine pages, but since I don’t have a subscription to those magazines I only have to do that on a rare occasion. Pattern Catalog subdivided by pattern type. I scroll through the patterns to look for something suitable. Patterns I have used are highlighted with a color. Usually I look through my “Favorites” folders first – they are patterns I really liked when I saw them or ones where I have fabric stashed and ready for a project. If I don’t have something appropriate in the Favorites folder I look in the sub-category folder most likely to have what I want. I also have a “Wishlist” folder where I store screen shots of envelope patterns I want to get, but don’t have yet. If/when I get them then I re-file in the appropriate place. For wardrobe patterns I put a copy of the pattern image in each appropriate location. My Envelope patterns are stored in plastic drawers by brand, then in numerical order. Burda Magazines are stored by year. Once I have use a pattern and have a traced/altered pattern I put it in a manilla envelope labeled with the pattern name/number. I store these separate from the original pattern in their own filing cabinate. I store alphabetical by brand name, then numerical so they are easy to sort through. For Burda magazines, I store multiple patterns in one envelope if they come from the same issue, and I write which pattern numbers they are on the front. Sometimes I also do a little line drawing of what the pattern looks like as well. Sometimes I will also make a photocopy of the instructions and write notes on them and store these with the pattern, or I might leave notes for future adjustments or notes about construction order. It is really easy to find a previously used pattern and whip up something with a TNT. My only exception are my skating patterns – I use these so often I keep them more accessible and don’t really store them with everything else. So, that’s my method to tame the madness. Anyone have any suggestions to streamline the process? What sort of pattern storage solutions have you all come up with? The only suggestion I have is…..can you come to my place for a week and do this for me???? This is brilliant!!! You are so organised! I'm going to have to start doing something like this. Oh my gosh, this puts me to shame. I've got my envelopes sorted by garment type and my Burda magazines sorted chronologically. And then there is the stack of favorites/new patterns/patterns I'm considering that temporarily live on the nightstand. But I don't have any kind of catalog. I was just thinking the other day how difficult it is to find anything in Burda since I don't have any kind of catalogue. Your system seems already very streamlined! I have my patterns in shoe boxes and a couple of wooden crates – one for sewing books and magazines and one for knitting stuff. It's a bit of a mess really. Thank you for the post! This is exactly which I need%) I am trying to make a digital catalog of patterns but because I bought a lot of magazines in short period of time the process is a little bit overwhelming. I need to make folder favorite too, this will help to organize sewing list. This. Is. Awesome. Totes inspired and must get on to this ASAP before patterns overwhelm me. I just remembered that I have my knitting patterns listed in a library page on my Ravelry account. I wish the Burdastyle website had a similar facility. After reading this blog entry I have decided to do a fabric stash audit. You are so organized! I'm extremely impressed. I have a system, but it's not great and I have more patterns than storage. Time to do some thinking. I have every.single.tax return I ever filed, and they're not that well organized. Come to my house and organize them for me.